There’s something strange going on in Fortnite right now. Controllers are rumbling randomly, when nothing is happening. There’s something in the sky that wasn’t there before. Nobody knows what any of it means. Smaller, more distant, not quite as bright. The picture from the top of the post, meanwhile, was taken this morning. 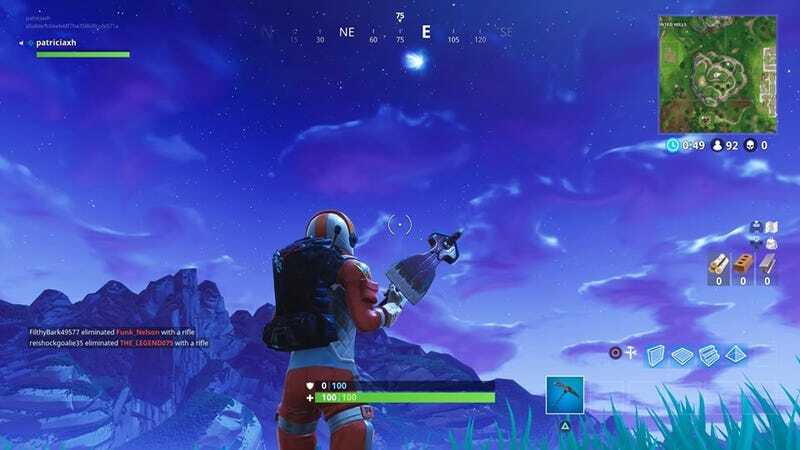 It seems that Epic is slowly but surely making this object more visible on the sky. But why? What does it mean? Earlier this month, a Redditor submitted a map idea where Tilted Towers gets transformed into a crater, and some folks think this might be what’s happening right now. The idea is that Tilted Towers will get nuked and flattened. While Epic has had fun with Redditors and incorporated their ideas into the game, it seems unlikely to me that Tilted Towers will specifically get targeted. It hasn’t even been here for very long. But who knows? While the timing might make this seem like a potential April Fool’s gag, the comet stuff seems to span much longer than this specific weekend. Actually, the entire Battle Pass season seems to be space-themed, and we still have weeks left to go before it’s over. During this season, one of the Battle Pass rewards is an astronaut costume. Savvy players have also noticed that other unlockables include stickers of eggs, dinosaurs, and an explosion. It’s as if Epic is referencing dinosaur extinction, something which was prompted by an asteroid. Will something big happen at the end of the current Fortnite season? Another leading theory is that this is all a build-up for Epic announcing that Save the World, the PVE portion of Fortnite, will become free. While I’m unsure there’s enough evidence to support this, it’s certaintly a move that would make sense: it’s baffling that anyone would pay for that portion in the game in the first place. Even with this info, given everything else that is going on with the comet, players are still trying to figure out what it “means.” One player mapped out where the rumbles happen, and another has tried transforming the rumbles into morse code. Until the issue is fixed, we’re likely going to get more theories about the rumble, and whether or not it connects to the wider mystery. Even after seeing all the evidence floating around, I have no idea what is happening. If nothing else, though, I love that Fortnite can get weird like this.